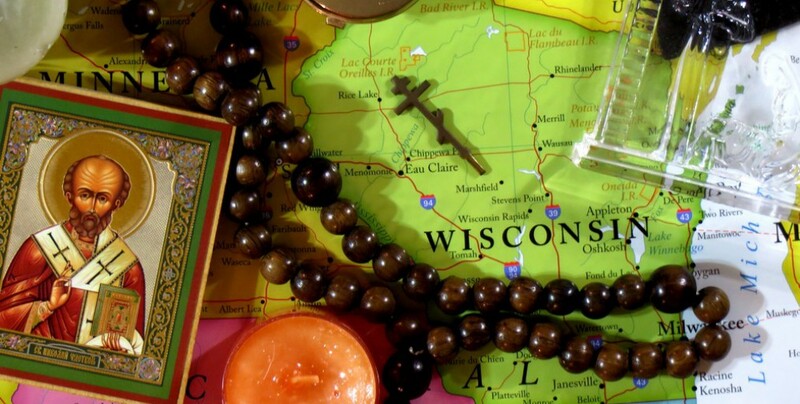 There’s still time to join Orthodox Christians from the Chicagoland area for this retreat, which is open to all Orthodox youth (6th-12th grade), parents, youth workers (18 years and older). Steven Christoforou, from the Greek Orthodox Archdiocese video series, “Be the Bee”, will be lead this wonderful retreat! Registration can be found here: http://bethebee.goarch.org/retreats. 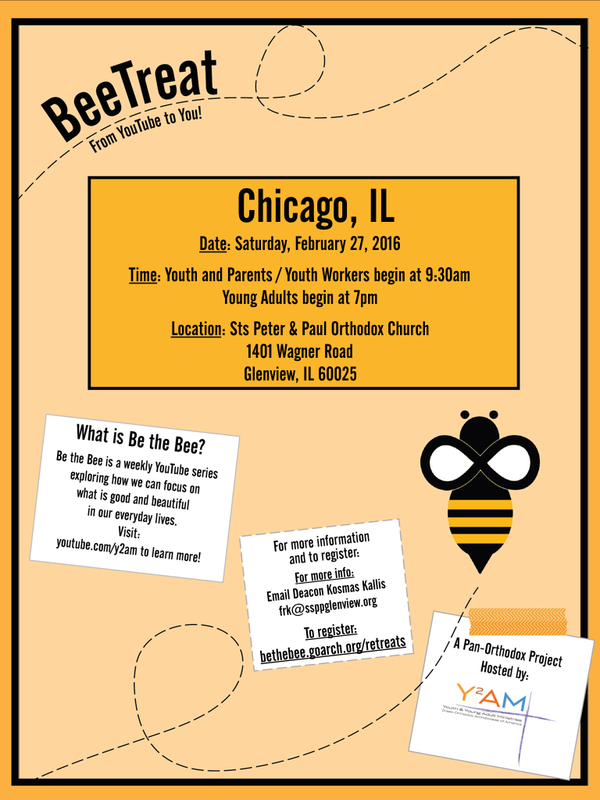 PLEASE RSVP BY FEBRUARY 25TH YALCHICAGO@GMAIL.COM. After returning to Russia, Fr. 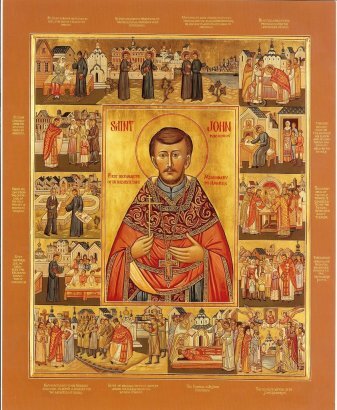 John was one of the first priests martyred in the Bolshevik Revolution. In 1994, he was glorified as a saint in the Orthodox Church. In acknowledgement of the 20th anniversary of the glorification of Archpriest John Kochurov’s sainthood (December 4, 1994), Holy Trinity Orthodox Cathedral will host several events from October 30-November 2. His Grace, Bishop ALEXANDER, will celebrate the vigil of the feast of St. John Kochurov on Thursday evening, October 30, as well as the Hierarchical Divine Liturgy on the feast itself, Friday morning, October 31. 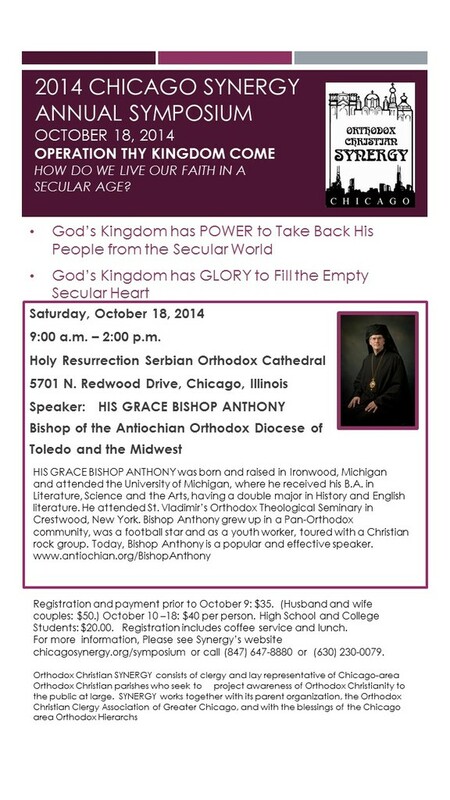 Bishop MATTHIAS will be in at the the Hierarchical Divine Liturgy on Sunday, November 2. A presentation on the life of St. John will be given by Dr. Lisa Gassin on Saturday, November 1, as well as a short story on the life of St. Sebastian (Dabovich), a Serbian missionary contemporary of St. John. St. Sebastian was the founder of Holy Resurrection Serbian Orthodox Church, originally located in Wicker Park. 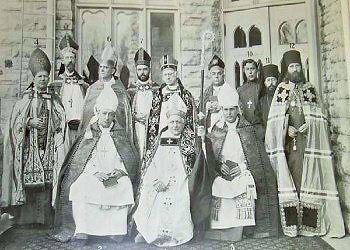 St. John Kochurov (10), St. Sebastian Dabovich (11), and Patriarch St. Tikhon (12) in Fond du Lac in 1900 for the ordination of an Anglican bishop. A special dinner and entertainment by the Russian Folk Choir, Golosá is being prepared for Sunday, November 2. Golosá is Chicago’s one and only Russian folk choir, founded in 1997 at the University of Chicago. The group sings sacred and secular Russian folk songs in a mixed-voice a capella ensemble, performing all year long throughout the Chicago area. Tickets for the dinner are $25.00 for adults, $10.00 ages 13 to 19, 12 years and under are free. Please contact nyurschak@gmail.com for ticket reservations. How Do We Live Our Faith in a Secular Age? Registration and payment prior to October 9: $35. (Husband and wife couples $50) October 10-18: $40 per person. High School and College Students $20. Registration includes coffee service and lunch. Please see Synergy’s website http://www.chicagosynergy.org/symposium or call (847) 647-8880 or (630) 230-0079 for more information.